Stumptown Stories presents Pixelate Your Wagon! on Tuesday, March 8, 2016 at Jack London bar (basement of the Rialto, SW 4th and Alder). Dive into the world of dysentery, death, and DOS with Joe Streckert (Interesting Times). Oregon Trail introduced a whole generation of school kids to the wonderful world of westward expansion. Learn about the origins of the game, how it evolved, and how it matches up to real history. I’m sure Joe will touch on a few of the points made in the video below, and other fun stuff from Oregon Trail. 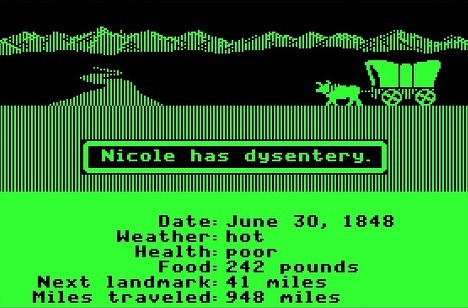 Note: Oregon Trail was created back in 1971 – way before the Apple II!